The new facilities, located in Donington’s Western Paddock, just 100 metres from the circuit itself at the Melbourne Hairpin entry, will also comply with the “Very Good” BREEAM sustainable construction standards and with the UK Government’s Low Carbon Economy and the National Planning Policy Framework requirements. This will ensure teams benefit from high environmental standards, effective energy management systems and the reduction of carbon emissions wherever possible – in-line with Formula E’s sustainability ethos. Formula E is a new FIA Championship using electric single-seater race cars capable of speeds in excess of 225km/h. Beginning this September in Beijing, the series will compete in the heart of 10 of the world's leading cities including London, Miami and Rio de Janeiro. Ten teams, each with two drivers, will go head-to-head to create a unique and exciting racing series designed to appeal to a new generation of motorsport fans whilst accelerating the electric vehicle market and promoting sustainability. Alejandro Agag, CEO of Formula E, said: “We looked at a number of locations around Europe but the British motorsport industry is regarded as the best in the world so it was an easy decision for us to be based in the UK and our new facilities at Donington Park provide the perfect central location for operating the FIA Formula E Championship. Being in the ‘Motorsport Valley’ also means we can take advantage of the technology and skills all around us, as we have already done through McLaren and Williams. All works will be complete by the end of April with the first teams moving in on 1 May. Formula E’s commercial aspects will continue to operate out of its London offices. Business and Energy Minister The Rt Hon Michael Fallon MP added: “Formula E's decision to locate the international teams and its global HQ at Donington Park shows how Britain's thriving motorsport industry is continuing to attract international investment. 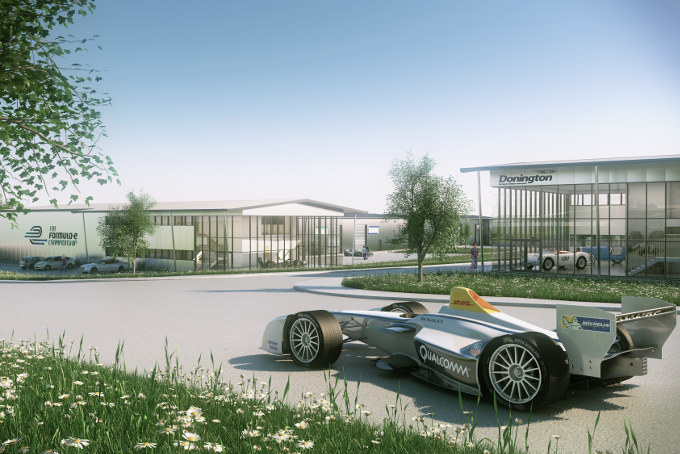 With investment from the Government's Growing Places Fund - secured through the Leicestershire Local Enterprise Partnership - Formula E's new facilities will further promote Britain as a leading innovator in developing technologies for energy-efficient cars. Motorsport is now one of the key growth sectors, and a great British success story."